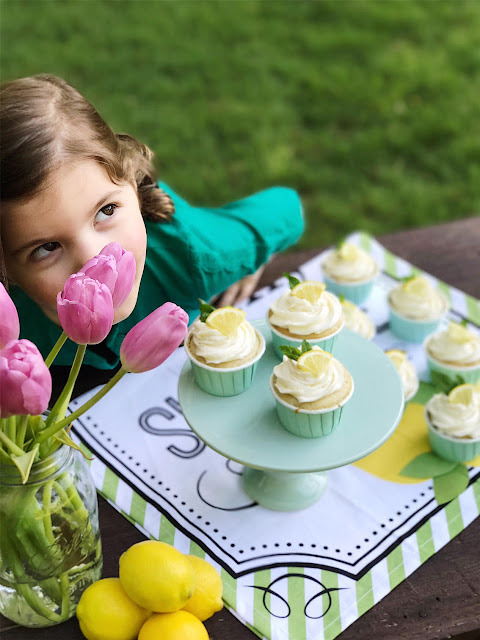 Finally getting around to sharing this yummy cupcake recipe with you. I made these for the kids lemonade stand we did over the summer. These cupcakes are delicious and so easy to make! 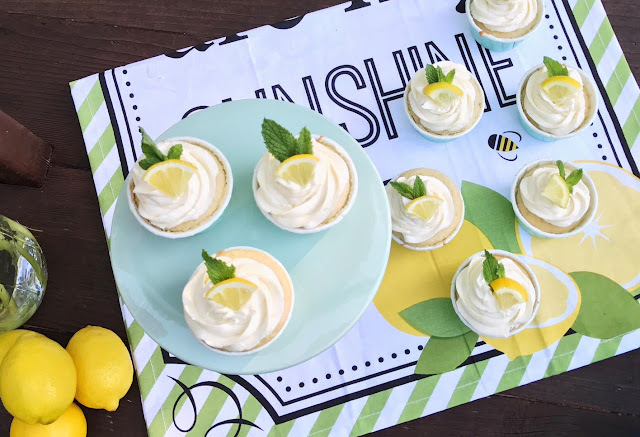 You can pair the cupcakes with any frosting you want but this lemon buttercream is perfect for summer. This cream cheese frosting is another one of my favorites. Set oven rack in middle position. Heat oven to 350 degrees. Spray cup cake pans with nonstick cooking spray or line with paper baking cups. Pour milk, egg whites, and extracts into 2-cup glass measure, and mix with fork until blended. Mix cake flour, sugar, baking powder, and salt in bowl of electric mixer at slow speed. Add butter; continue beating at slow speed until mixture resembles moist crumbs, with no powdery streaks remaining. Add all but 1/2 cup of milk mixture to crumbs and beat at medium speed (or high speed if using handheld mixer) for 1 1/2 minutes. Add remaining 1/2 cup of milk mixture and beat 30 seconds more. Stop mixer and scrape sides of bowl. Return mixer to medium (or high) speed and beat 20 seconds longer. 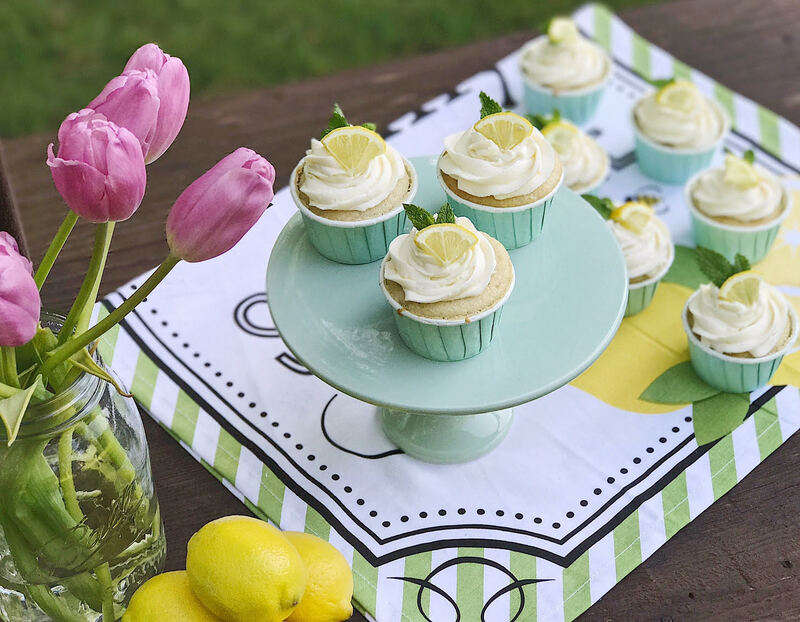 Fill cupcake tins no more than 2/3 full; using a rubber spatula, spread batter to smooth tops. Arrange pans at least 3 inches from the oven walls and 3 inches apart. (If oven is small, place pans on separate racks in staggered fashion to allow for air circulation.) Bake until thin skewer or toothpick inserted in the center comes out clean, I start checking at about 15 minutes. Let cakes rest in pans for 3 minutes. Loosen from sides of pans with a knife, if necessary, and place onto wire racks to cool. Let cool completely. In the bowl of an electric mixer fitted with the paddle attachment, whip butter with lemon zest on medium-high speed until very pale and fluffy. Make sure to scrape the bowl halfway through if the paddle doesn't scrape the bowl while mixing. Mix in 2 cups powdered sugar, then add the lemon juice, cream and vanilla extract. Add the remaining powdered sugar and whip until very fluffy, about 4-5 minutes longer. 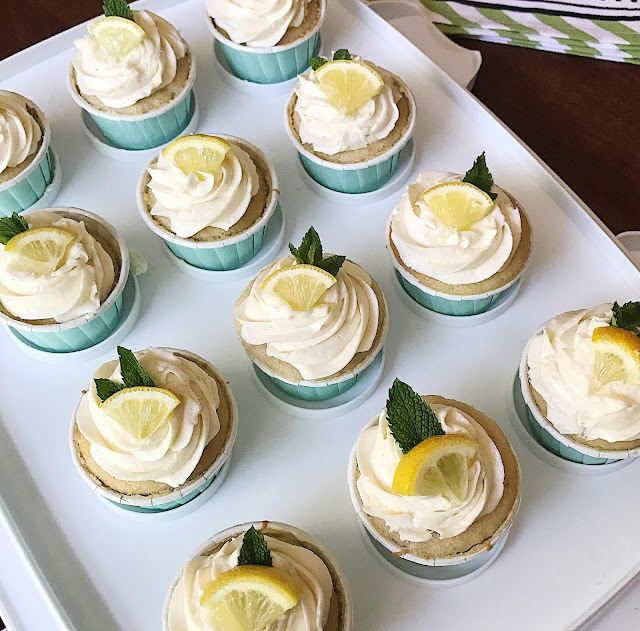 Pipe frosting onto cupcakes and garnish with lemon wedges and mint leaves as desired. Also, check out this recipe for easy fresh squeezed lemonade.